When an individual young walnut tree turns yellow compared to all of its neighbors it often indicates that there is something going wrong in the root system. There are a variety of potential causes for these symptoms. Below is an overview of possible causes. Water-Logging. Injury due to either excess irrigation or periods of excessive rainfall is common. When walnut roots are excessively wet they can die from lack of oxygen even without any major pathogens present. Good pre-plant soil preparation and proper irrigation management are key to avoiding this problem. Moisture Stress. Young walnut trees are very sensitive to moisture stress and will stop growing at relatively low stress levels. Root systems need to be kept moist but not wet enough to favor root rot fungi and/or low oxygen conditions. Pressure chambers are the most effective technique for measuring tree water status. Research suggests walnuts will slow shoot growth at –8 bars Midday Stem Water Potential. Soil augers are useful for visual soil moisture evaluation and various soil moisture sensors are available. Be careful when using an irrigation system designed for a previous orchard. With different tree spacing in a new orchard, sprinkler water application may not reach small root systems in the young orchard or may concentrate too much water near the trunk resulting in tree stress and poor growth. Soil-borne Diseases. Diseases affecting crown and root systems of walnut trees include Phytophthora root and crown rot, Armillaria root and crown rot and Crown gall. Phytophthora and Armillaria cause similar above ground symptoms: poor terminal growth, small chlorotic leaves, premature defoliation, decreased productivity, dieback of terminal shoots and subsequent collapse and death. Phytophthora. Disease severity depends upon Phytophthora species, soil type, climatic conditions and tree age. Excessive soil moisture favors infection. Phytophthora affects the inner bark and cambium typically staining the wood and creating dead tissue (canker) that can extend above ground up the tree trunk. Black ooze from infected, decayed bark may be noticeable on the scion or the above-ground portion of the rootstock. Removal of the outer bark reveals dead, brown tissue with a water soaked zonate appearance (a series of reddish brown lines in the tissue) near the margin between healthy white and infected brown tissue if the fungus is active. Armillaria (Oak root fungus). Armillaria is identified by removing dead bark from crown or root tissue and looking for creamy white fan shaped fungal growths (plaques). These plaques are usually most abundant between the bark and woody tissue at the crown. The most reliable diagnosis is the presence of rhizomorphs which resemble brown to black shoestrings that may be found adhering to the outer bark of roots. They develop best in moist soil. Armillaria may produce clusters of mushrooms around the base of infected trees following rainfall, usually from October to February. Crown Gall. This disease, caused by the bacterium A. tumefaciens, is relatively easy to identify. Young galls are roundish shaped growths on root and/or crown tissue. Galls are made up of undifferentiated, spongy tissue, which eventually dies in the center, creating an open cavity. Galls most often develop on root or crown tissue underground and may not be noticed until they enlarge and push soil up around infected trees. 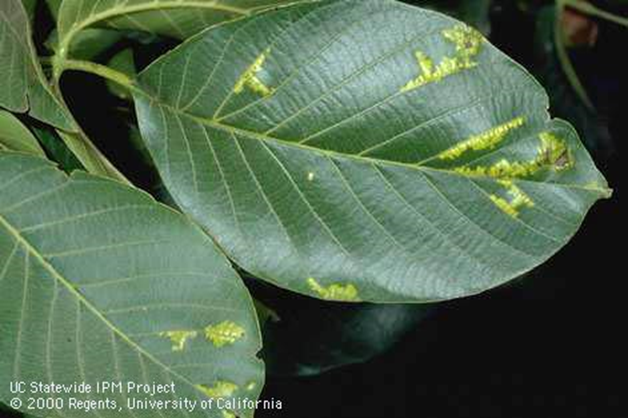 Crown gall infected trees will be stunted, demonstrate poor growth and yellow foliage. Untreated galls can girdle the tree. Nematodes. The four most common genera of nematodes that damage walnut roots are Root lesion (Pratylenchus vulnus); Ring (Criconemella spp. ); Root knot (Meloidogyne spp.) and Dagger (Xiphinema spp.). Nematodes seldom kill trees, but act in conjunction with other stress factors to reduce growth and yield, particularly in replanted orchards without pre-plant soil fumigation. Walnut roots may exhibit dark elongated lesions on inner bark tissue or show knots or galls. Send a soil sample with feeder roots to a lab to confirm an initial diagnosis. Vertebrates. Rodents are potential pests in all orchards, but they are more likely to invade orchards next to rangeland or unmanaged areas. Voles, also called meadow voles or meadow mice, may feed on the bark of young trees particularly when vegetation around tree trunks offers cover. Pocket gophers are potentially serious pests especially in young orchards. Root damage results in poor tree growth and girdling can result in tree death. Look for parallel tooth marks at feeding sites on the wood.